The luxury 100% cotton hooded bathrobe is another style which we are offering from stock. The classic bathrobe with attached hood is available in two sizes (S/M and L/XL) suitable for both ladies and men. The hooded bathrobes have front pocket and is ideal for further customisation. As part of our personalising service means you can have these hooded bath robe decorated with embroidery of your choice. 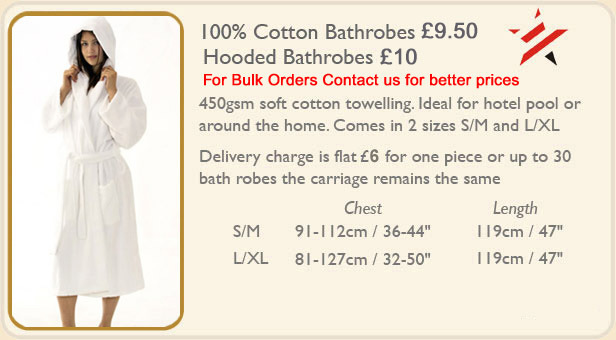 If you intent to buy hooded bathrobe in bulk then contact for a better quote. We have been supplying hooded bathrobe for the last many years which means we have developed the range to ensure that the robe is of great comfort. The more you buy of these hooded robes the more you save. Place your orders for hooded robes you can either Email on (sales@bathrobesuk.co.uk) or Telephone (0208 503 0563). If you require these hooded bathrobes for same day delivery (if you are based in London) then contact us for delivery charges! We only stock only the best quality 100% cotton hooded bathrobes. Our commitment to environment and social working conditions means we only source bath robes from places which adhere to International ISO standards. This ensures our customers receive quality, value for money hooded bath robes.